Warm/Cool color palette and perspective. *Need to give credits to Deep Space Sparkle-I adapted from her lesson and the students love doing this 🙂 Thank you! 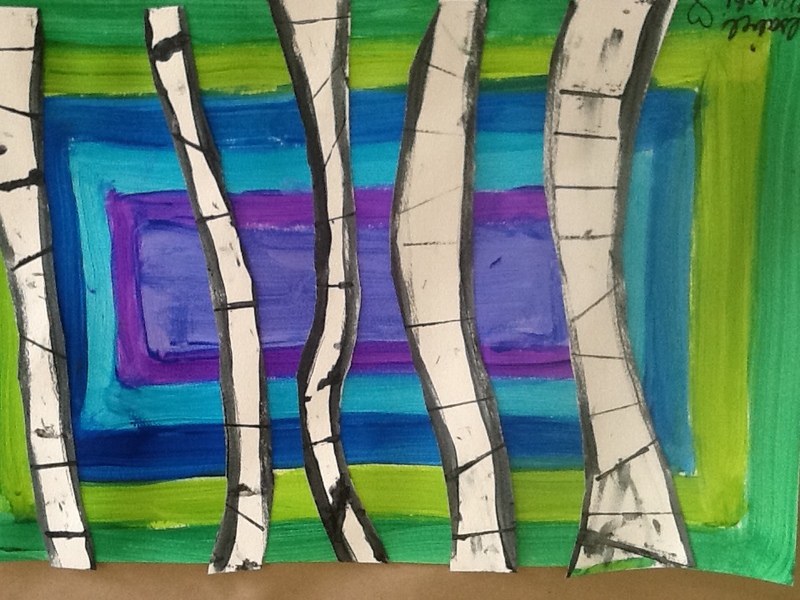 Begin by discussing and showing students birch trees and the shapes and marks they have on their bark. Then discuss warm colors (fire is what I use to help them remember) and cool colors (the ocean). Then have them pick which palate they are going to use warm or cool. They will all ask to add one or the other to a palette but stick to the plan and only put the 4 colors on their plate :). They can do stripes or swirls, dots they just need to cover the entire background with the chosen color palate. Set aside and work on the trees. Have them take their second sheet of white paper and use small brushes to paint their trees. Go over on white board with them how to draw wavy lines and so forth. Then have them take black tempera paint and paint 4-5 trees using the method you instructed. Then use the cardboard pieces and show them how to make the fun markings on trees. Once they finish use the scissors to cut trees and glue on to warm/cool color background. Then sign and you are done.